The ringing of the Gaol bell heralded the start of each new day. These daily activities changed very little in the Gaol’s 147 year history. The following daily routine was in force at the time the Gaol closed in 1988. 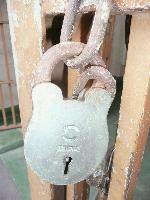 Unlock, stand at your cell door properly dressed, no smoking. When told, you will leave the cell area. All inmates to return to their cells when called and cells will be ready for inspection. Clear the recreation/mess area. Yard and recreation area cleaners to work. All inmates to return to their cells and stand by the doors for lock up. Barriers and cellblock secured, inmates to recreation area. Barriers unlocked workers to their jobs. Inmates return to their cells for lock up. Difficult and suicidal prisoners were often kept in solitary confinement so that they could be closely observed. As late as 1988, when the Gaol closed, two cells in A Wing of the ‘New Building’ were used for solitary confinement. They were set up with an additional sound proof door to accommodate violent and substance affected prisoners. These cells were called the ‘Fridges’ because of their refrigerator like door handles and because they were cold, dark and airless. Up to the end of the 1890s, a prisoner could be sentenced to receive up to 150 strokes. In the 1930s this was reduced to 25-30 strokes and in the final years an average of 8-12 strokes. Whippings were abolished in the Adelaide Gaol in 1976. The last whipping was performed in July of 1964. 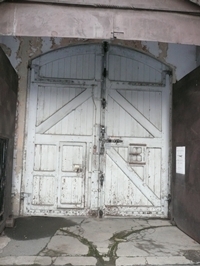 A total of 45 executions were performed in the Adelaide Gaol. Initially, executions were public and were held in front of the Gaol’s main gates. Up to 2,000 people attended a public hanging. An act of Parliament in 1861 abolished public hangings resulting in a portable gallows being constructed in the North West laneway. This gallows was packed up and stored after each execution. In 1888 a permanent gallows was incorporated in the upper level of A Wing in the New Building. This gallows was in use until 1950 when one of the “lookout towers” was converted and became the “Hanging Tower”. The last hanging in South Australia was in 1964. Once a sentence of death was pronounced, prisoners were held in a condemned cell where they could be observed for 24 hours per day. This would have been to ensure that they didn’t commit suicide and would also have provided some company for their last days. Appeals against the sentence would have been lodged during this period. On the morning of the hanging, the prisoner would have been held in a cell adjacent to the gallows. At the appointed time, he would have been led to the trapdoor where his arms and legs would have been secured, a white hood placed over his head and the noose was then applied. On a signal from the senior official, the hangman would pull the lever causing the prisoner to drop to his death. After confirming that the prisoner was dead, the body would be removed and placed in a plain pine coffin filled with quicklime. This was then buried in the Gaol grounds. 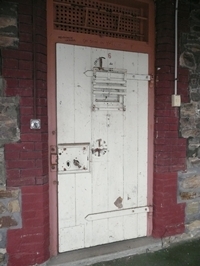 Life in Gaol was hard for all inmates, particularly when the Gaol first opened. Originally, the Gaol had its own well which provided drinking water to the inmates and staff. In the early 1900s this well was closed due to high levels of pollution in the water. The water was contaminated due to its close proximity to the River Torrens which itself was polluted from the burying of the prison and City’s human waste. These conditions encouraged such diseases as Small Pox, Typhus Fever, Impetigo, Tuberculosis, Typhus (Gaol Fever) amongst the Gaol prisoners and staff. Doctors only visited the Gaol two or three times a week and what equipment they had was second hand and out dated. It is not surprising that many prisoners and officers died as a result of poor health. Over 200 people died at the Gaol during its 147 year history. It should be noted that a number of these casualties were through suicide or self inflicted injury. Some prisoners would deliberately try to mutilate themselves in an effort to get out of work. All prisoners, male or female, were expected to work whilst in gaol. In the early days of the Gaol the tasks were mainly labouring type jobs such as working in the vegetable gardens that surrounded the Gaol or the olive groves that had been planted to produce olive oil to be sold to the public. Prisoners dug trenches for Gaol refuse and assisted workmen from the Public Buildings Department. They made and repaired hammocks, cut firewood, repaired boots, resurfaced yards, performed carpentry, repaired tinware and did all the necessary work required in cleaning, whitewashing and painting the Gaol and its surrounds. The female prisoners either had sewing work or ‘picked’ oakum (unravelling hemp ropes) so they could be used for other purposes, such as bedding material. The bakery in the Laneway, saw the production of fresh bread and rolls. Money the prisoners earned performing these tasks enabled them to purchase ‘luxury’ items from the canteen such as chocolate, cigarettes, etc. Ironically, morning and afternoon tea for the Supreme Court was baked at the Gaol. In addition, all the bread and cakes for the Gaol and all of the prisons around Adelaide were baked at the Adelaide Gaol. To work in the Bakehouse or the Kitchen was considered a good job. Often favours could be traded between prisoners, e.g. an extra cake or bun for more starch in a shirt, etc. In one year, the Bakehouse made and baked nearly one million bread rolls and 75,000 loaves of bread. During this time, prisoners worked a number of shifts to maintain production. Of course the Gaol Bakehouse was maintained in spotless condition throughout its working life. Many prisoners became skilled enough to obtain work in bakeries outside the Gaol after their release. Prior to the 1950s Gaol food was very bland. It consisted of beef on Sunday, mutton or rabbit with tea, bread, potatoes and porridge for the rest of the week. This poor diet often caused illness and diarrhoea among the prisoners. After 1955, the prison diet improved markedly. Fresh fruit and vegetables were included and by 1976 the quality of food and general living conditions were impressive. A new Kitchen was built in the mid 1970s at a cost of $100,000. At this time the prison routine was changed and prisoners ate their meals in communal areas to overcome the concern that they were losing their social skills by having to eat in their cells. Food was prepared in the Kitchen and wheeled in stainless steel trolleys to each yard for distribution. No glass or metal cutlery was allowed following an incident in which stainless steel cutlery was used in an attempted escape. 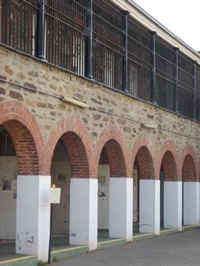 In the later period of the Gaol’s history, prisoners worked in the laundry area washing nappies and bedding for hospitals and other Adelaide institutions. Initially, the Laundry only washed Gaol items but by the mid 1950s it was processing tons of babies’ nappies from Adelaide’s maternity hospitals as well as large volumes of Army blankets. The Laundry provided one of the best methods of smuggling contraband into the Gaol. Usually, illegal substances (often alcohol or tailor made cigarettes) were smuggled into the Gaol in a bag of soiled nappies with a prearranged knot. These special bags would be opened by the inmates when the officers weren’t watching and the contents shared around after lights out. During its working life the Adelaide Gaol produced a range of fruit and vegetables from the land around the Gaol. In 1918 part of a paddock was planted with onions. The crop was used within the Gaol and one ton of onions were sold to the Government Produce Department. Other crops included potatoes, trombone and a variety of other vegetables. Olive groves adjacent to the Gaol were maintained by prisoners for the City Council. In the 1880s, it was reported that the Sheriff, with untiring zeal, had carefully tended the plantations near the Gaol and they were aiding the City Fund with the proceeds of their oil sales. By 1906, the plantation was flourishing and South Australia’s Premier, Tom Price mentioned that the only place he could obtain pure olive oil was at the Gaol. This brought some protest from other olive growers who believed their crops were also of high quality. 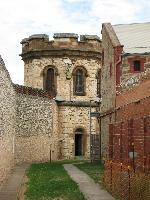 As a result, production of Adelaide Gaol olive oil was discontinued. Prisoners who could read and were well behaved were allowed to borrow from the prison library. The library was stocked by donations and according to prison records was well used and appreciated by the prisoners. This was born out by the fact that in 1918 the Annual Report of Gaols and Prisons stated that the books were in a “dirty and dilapidated condition” and needed replacement. 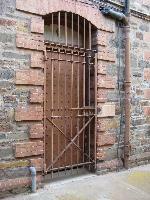 Originally, visitors to the Gaol shouted to their friends and family across a distance of several metres and were separated by a brass bar. The noise level with a group of visitors shouting on one side and a group of prisoners responding on the other made communication very difficult. At the turn of the century visits were restricted to 10 minutes every 2 months for sentenced prisoners serving over 3 months. Later, this changed to 20 minutes each month. A new Visitor Centre was partially erected in 1958 to replace the old ‘Sally Port’ system. This new Centre had no roof but provided some privacy and helped to control the noise level. 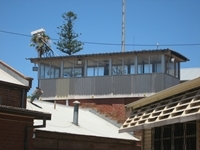 Over the years a number of modifications were made to this structure to reduce contraband entering the Gaol. In 1977 a roof was installed on the Visitor’s Centre. 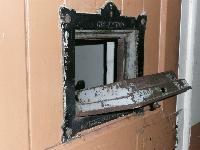 This kept both visitors and prisoners out of the weather and was more effective in controlling Gaol contraband. Read about an 1878 visit to the Adelaide Gaol. 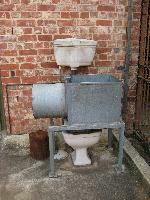 Disposal of night waste was quite advanced during the Gaol’s early days considering Adelaide’s sewage system was introduced in 1881 (water was 1861). Prisoners dug trenches out the back among the olive groves where they buried the Gaol and Adelaide’s ‘night soil’. Unfortunately, this ‘night soil’ seeped through into the Gaol’s water system and caused considerable illness and in some cases, deaths. When mains sewage was introduced it was too costly to connect each cell. The Gaol continued with the ‘bucket system’ and in later years each prisoner had two buckets in their cell. One for body waste and one for paper waste. In the 1980s some Porta Potties were introduced for the prisoners.